So tonight, or last night, depending on when you have read this page. I started a very exciting project. I tried to sign about 600 books – 3, 2 and 1. Nothing like finally getting the kickstarter rewards in full gear. Books should start shipping in about 2 weeks. Well back to signing. I don't have any Bean books, but if anyone is reading this comic online and thinking about whether it's worth it to get a book, let me just say that it will amaze you how much difference it makes to read in print. I read loads of webcomics, and as I get extra money here and there or someone draws my name for Christmas or whatever, I pick up print copies of my favorites. It never fails to surprise me (even though you would think I would have learned this by now!) how much more impressive the art is "in real life". I guess it's kind of like comparing talking to someone over a video link to talking to them face to face. I'm a little stretched on my Christmas budget at the moment, so I feel a bit hypocritical saying this when I can't really buy any of these books right now, but I just want to throw in an endorsement for getting a print copy of your favorite comics. You'll be glad you did! 600 books?? 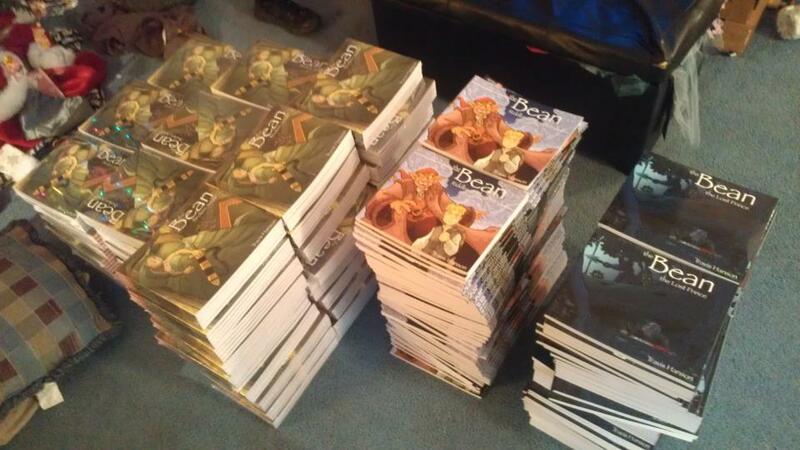 I sincerely hope that you are not going to try to sign them all in one sitting. That would be really bad for your drawing hand, and then we would have to wait extra time for the next update. Not to mention that it would hurt a lot. The last few panels have been absolutely fantastic. It would be a cool tradition for authors to start signing their work with their off-hand to save their drawing hand. It's not like you can read signatures anyway :). Also glad you have enjoyed the last few panels. Ooh, I'm excited for the book to ship out! I like reading the books a lot more than the webcomic–feels more real. Not that I don't love the story regardless of the format, because I do. Also, glad to see you'll be at Emerald City Comicon again. Hopefully I'll see you there in March! I'm wondering if "amazed on" in the third panel shouldn't be "amazed by"? Perhaps that is something that the proofreader would deal with before printing, so it's of no help to point it out here? This is very exciting! I'm so looking forward to getting my book. Not to harp on this but, have you considered doing full color versions of these books in PDF format? That might be more workable than printed versions. I know I'd purchase all three all over again if I could get them in color. Your color work is fantastic. I look forward to getting them to you. The problem with color is more of a time issue than anything else right now. My main goal is finish the tale- there is much more to tell. So I focus there. You see it adds another 3 to 4 hours to a page, and since this is not full time and I have other illustration gigs, I figured I would focus on finishing the story first. As for color, that is not out of the question. 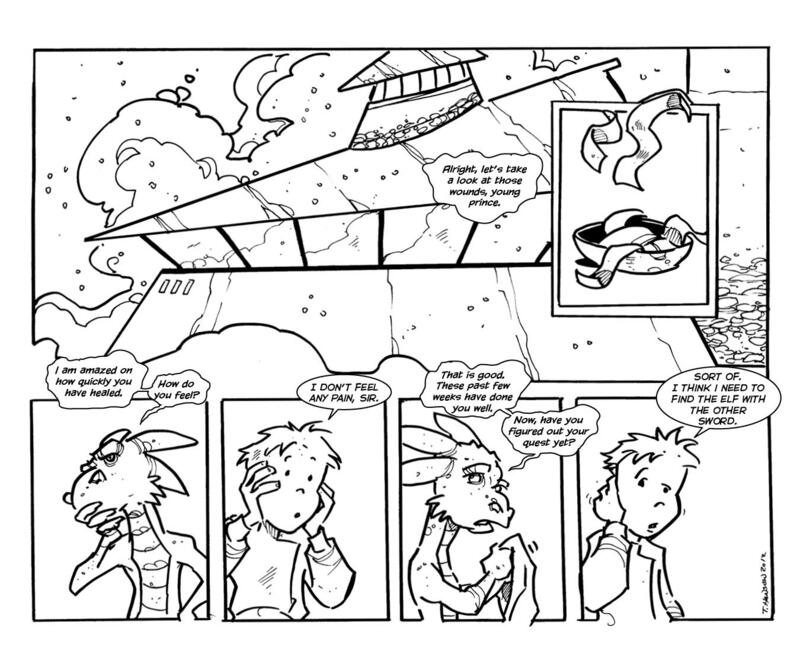 In fact when the tale is done – I am going to color the whole thing. 🙂 but that is a few years off.